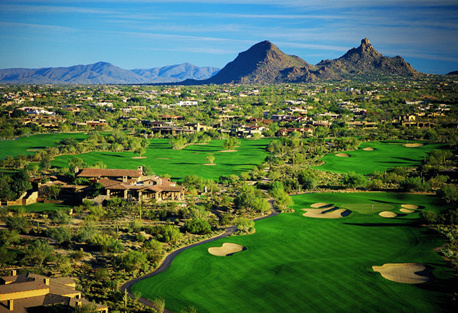 Residents and golfers alike enjoy long distant vistas over the valley floor with its city lights at night, as well as stunning views of lush green golf courses, the rugged desert and the McDowell Mountains. The master plan for DC Ranch was developed by Vernon Swaback AIA. It offers a true sense of neighborhood with villages that conform to the land and its natural features. A network of walking paths winds through the 3,700-acre community, connecting homes to amenities, schools, churches, parks and shopping. DC Ranch is also a wired community. Every home is wired with fiber optics for telephone, cable and high-speed internet access. A community center offers residents swimming, tennis, basketball, volleyball, fitness. DC Ranch offers a stunning Scott Miller-designed golf course. A par-71, 6,872-yard test, it features four tees on each hole and has earned a 72.4 rating and a slope of 130 from the professional tees. Every hole frames spectacular views that surround this golf course. A clubhouse membership includes the use of swim and tennis facilities as well as dining. Use of the golf course is not included. Every home at DC Ranch is wired with fiber optics for telephone, cable and high-speed internet access. A community center offers residents swimming, tennis, basketball, volleyball, fitness. The private Country Club at DC Ranch is situated in the heart of the Sonoran Desert, architecturally designed to blend into the environment while recalling memories of the 1920s and 1930s grand western resorts.